Another successful summer of Nosing & Tasting Evenings and again we say a big thank you to all the distilleries and distillers who supported us. All proceeds from the Nosing & Tasting Evenings goes towards the refurbishment of the Whisky & Heritage Centre. 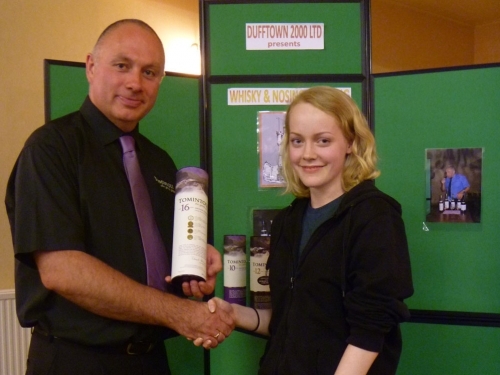 The 2013 whisky nosing and tasting evenings started off on the 26th June when Dufftown 2000 Limited presented a selection of whiskies from Around Scotland. Gordon Haughton and Ren� Ramon began their tour with the 2011 Whisky of the Year �Black Bull� 12yo, made of 50% Malt Whisky & 50% Grain Whisky and bottled at 50% ABV. They started with Single Malts in the Lowlands with Inchmurrin 12yo at 55.3%, and then travelled to Speyside with Singleton of Dufftown 12yo. This was followed up with an Eastern Highlander; Glen Deveron 12yo at 40%. Finally an Islay, Bowmore Mariner 15yo at 43% ABV. The small but dedicated audience enjoyed the evening and the winners of the Nosing Competition were Herbjorn Johansen & Terje Christiansen from Norway. 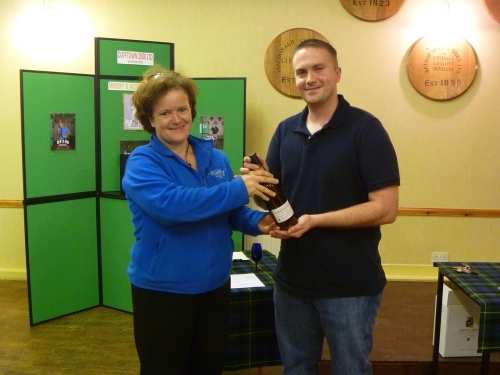 The 3rd Tasting of 2013 was presented by Andrew Simm of Tomintoul Distillery. He brought along Tomintoul 10yo, Tomintoul 12 Oloroso, Tomintoul 12 Portwood , Tomintoul 16yo and the peaty Ballantruan. 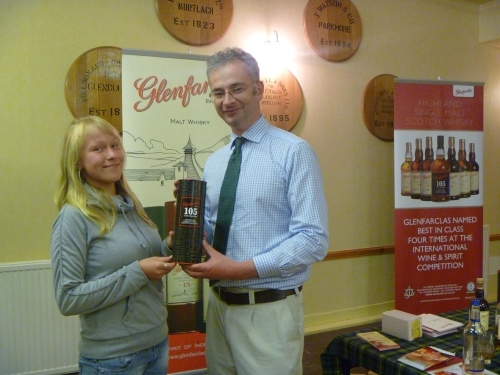 The winner of the nosing competition was young Sara Nordstrand from Sweden here presented with a bottle of 16yo by Andrew. The Balvenie event was hosted by two new Balvenie Ambassadors from America, David Laird and Jonathan Wingo. They brought with them a great selection; Balvenie 12yo Double Wood, Balvenie Single Cask 12yo, Balvenie 17yo Double Wood, 21yo Balvenie Port Wood and lastly the Balvenie Peated Cask 17yo. The audience enjoyed every dram but named the Port Wood as the best. 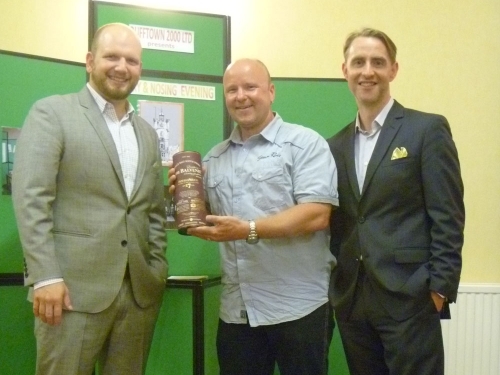 The winner of the nosing completion with 5 correct answers was J�rgen W�nsch from Germany here presented with a bottle of Balvenie 17yo Double Wood by the Ambassadors. The second Nosing & Tasting of the year was presented by Antonia Bruce, Marketing Manager of Adelphi Distillery. She told the audience about he forthcoming building of the new distillery on Archnamurchan before presenting the following single malts; Clynelish 1997, 15yo at 53.2%, a Blair Athol 13yo at 59%, a GlenRothes 6yo at 67.4% and lastly a Tobermory 18yo at 58.8%. 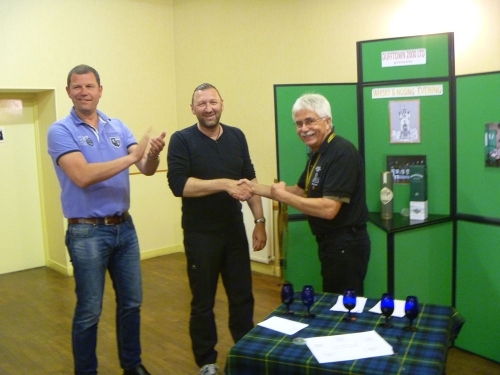 All drams were very much enjoyed by the audience and the winner of the nosing competition Tim Cline from America was given a 21yo Liddesdale by Antonia. On the 17th of July a full audience came to the BenRiach Distillery tasting which was presented by the incomparable Stewart Buchanan, Brand Ambassador of the BenRiach Group. Stewart brought along a superb selection from the distillery notably: Benriach- 12yr Sherry wood, 12yr classic, 16yr Sauternes finish non peat, 10yr Curiositas, 13yr peated Madeira finish and ended with a 34yo BenRiach sherry-wood which was thoroughly enjoyed by the 20+ people. 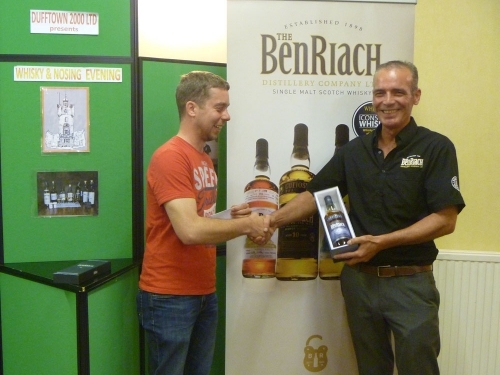 The winner of the competition after a �nose-off� was Sebastian Minden from Germany who received a bottle of BenRiach Horizon from Stewart. The sixth Nosing & Tasting was hosted by Robert Ransom from the GlenFarclas Distillery. Whilst sampling GlenFarclas 10yo, the 21yo, the 30yo and the GF 105 Robert explained to the audience why GlenFarclas keeps to the traditional way of distilling through the 6 generations of the G&J Grant family. The superb sherry cask single malts and the samples of American & Spanish were well enjoyed by the audience. The winner of the Nosing competition with all correct answers was Melanie Nowack from Germany receiving here a bottle of GF 105 from Robert.